If you don’t like seafood or you can’t eat it, this Chicken Paella is the one for you. It’s easy to make and full of flavor. Chicken is a must, but you can also add other meats, such as chorizo, to intensify the flavor. One of the most important parts of a good paella is the sofrito. It is the base that gives it flavor and should be composed of tomato (either natural or crushed) and onion, at least. It has to be fried for a few minutes until the tomato is reduced and the onion is softened, that’s when the sofrito is well done. The steps to follow to make a paella are almost always the same. 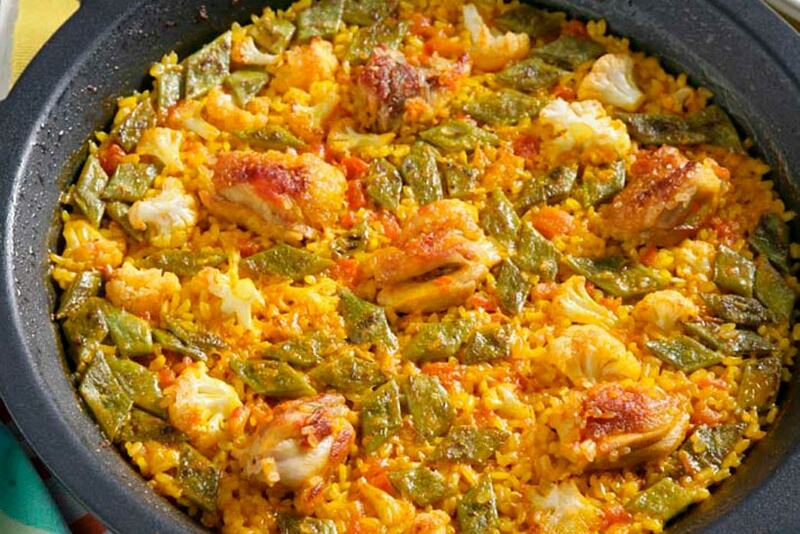 For the traditional paella recipe or other recipes check the home page! To start, pour a dash of olive oil into the paella pan and heat over medium heat. In the meantime season the chicken pieces with salt and black pepper and then fry them in the hot oil until they take color on all sides. Next, add the sliced chorizo and paprika and stir to mix all the flavors. Then sprinkle the saffron on top and let it cook for about 15 minutes to infuse. When it´s cooked, move the meat towards the edge of the paella pan to make the sofrito. First, add the finely chopped onion and sauté until tender. Then add the chopped tomato and let it reduce until it becomes a dark red paste. Next, mix the meat with the sofrito and add half of the roasted capsicums. Mix everything again and keep cooking for a few more minutes. Then pour the hot broth on top to remove all the ingredients stuck to the base. Add the green beans and increase the heat to boil. Next, add the rice and stir to combine well, make sure the rice is completely covered by the liquid. Cook for 10 minutes over high heat and then lower the heat to continue for another 10 minutes until the rice begins to dry. Once most of the liquid has been absorbed, try the rice. If it is still hard, add more broth and continue cooking for a few more minutes until al dente. Then cover the paella with a cloth and increase the heat for a minute or two, so that the bottom sticks. To finish, turn off the heat and decorate the paella with a few slices of lemon, the rest of the roasted peppers and rosemary. Once it has rested for 10 minutes, it can be served. And that is how easy it is to make a Chicken Paella! Be sure to check out our other versions or Meat Paellas here!